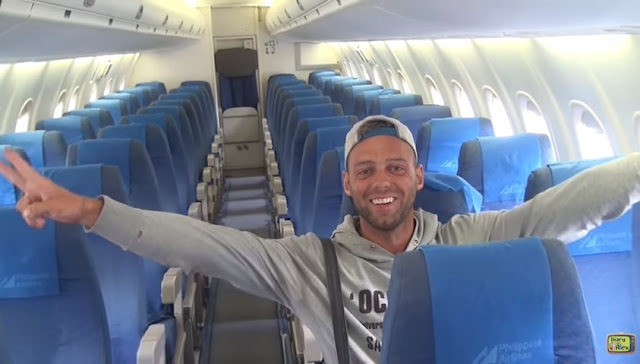 MANILA, Philippines - A lucky Austrian travel blogger had the entire plane to himself from Manila to Boracay flight as he was the only passenger who showed up, reports said. MailOnline shared that Alex Simon, 28, from Ischgl, Austria, was surprised when no one else boarded the Philippine Airlines (PAL) flight – leaving him alone with two attendants and two pilots. "When I arrived to the airport I just heard my name on the speaker, "Sir Alexander Simon, please come to the information." Simon get the chance to to enter the cockpit and talked to the pilots before the plane took off. "So the lady explained to me that I don’t need to wait two more hours on my connecting flight, we’re gonna start in 30 minutes because there are no more passengers except me," Simon said. "I was little bit surprised and I couldn't believe it. I thought I was dreaming. Later while boarding I just realised that it’s gonna be a special flight because this time I didn´t even need to line up," Simon added. He added: "I took my seat then I asked the flight attendant lady if I can sit next to the window. She just answered, “You can sit anywhere, because you’re the only one passenger”." He said that PAL staff member told him flights on the same route are usually packed. "It was an unforgettable feeling to take a flight to the one of the most beautiful islands of the world, but to be alone and feel like a superstar it made it more special." "I just had luck, I think, that no one else was interested on this day to fly to paradise." Simon posted the video of his rare experience on YouTube last February, but it went viral this week after being shared by some international websites. Meanwhile, PAL management is yet to release statement on the said viral video.